The Royal Petite Model 809 four wheel walker/ rollator offers many great features in a 4 wheel petite Walker. 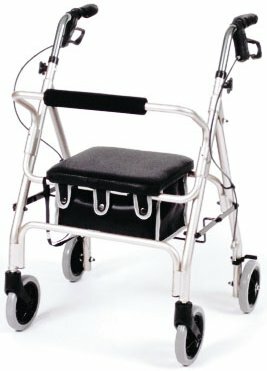 This Walker sits low to the ground to aid those who require a hemi height walker. The locking loop brakes and standard padded back rest add safety and comfort. The folding seat and storage pouch are standard. The Royal Petite is available in both Red and Champagne colors. The Height adjustable handle from 30" to 34" make this a very versatile walker. Seat Height to Ground 18"
Adjustable Height 30" to 34"